This one is fairly simple. 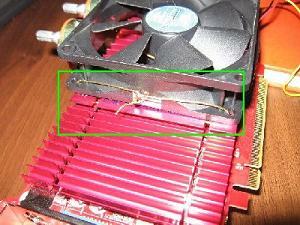 Just attach the 92mm fan to the stock heatsink, by drilling a few holes, and securing it with some strong wire. This also provides a nice place to mount the potentiometers. Also included is the thermistor -> fan controller mod. After this fan mod, load temps dropped by around 10 degrees celcius. 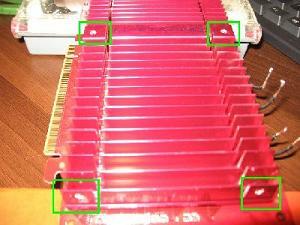 Firstly, drill four holes in the heatsink where marked. 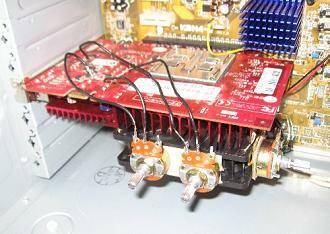 Removing the heatsink from the card would make this job much easier. Now just thread the wire through the holes in the heatsink, and the holes in the fan. Just make sure the fan is pointing in the right direction before you tighten it with some pliers. Well, that wasn't too hard! If you want to mount the potentiometers on the side of the fan, just use some double sided tape, or blu-tack might even work.